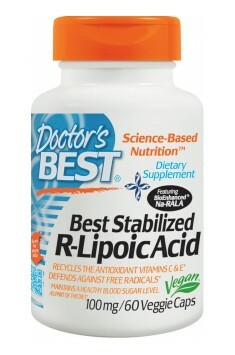 Stabilized R-Lipoic Acid 100mg 60 caps. A very good combination of a-lipoic Acid with D-biotin. Pro-health effects of this product generally improve the condition of the body. Useful for people who want to improve insulin sensitivity. it's often recommended for athletes to increase aerobic capacity and increase muscle strength. The manufacturer talks about using one to two capsules a day, between meals. I know that there are studies suggesting that doses can be higher - up to 600 mg a day, and it's still considered to be completely safe. Athletes can combine it with for better results after a workout. Alpha-lipoic acid is well-soluble both in water and in fats, therefore it does not need to be taken with fatty meals. Its absorption also does not require the presence of fatty acids in the intestines, therefore it may be taken on an empty stomach. Dosing of ALA is often dependent on the goal that we want to achieve. For prophylactic purposes, 1 capsule a day is sufficient, while in case of diabetes and increased physical activity, it is worth increasing the dose to 2 or even 3 capsules a day. It contains 8 strains of lactic acid bacteria. It is effective in diarrheas and constipations.